Computer science is on the decline in American high schools. According to new research from the Computer Science Teachers Association, not only have the number of students enrolled in computer science has dropped significantly in the last four years and so have the number of AP computer science courses offered at high schools. "The continuing drop in students taking AP CS is a serious warning sign about the state of computing in this country, as a student taking AP typically indicates his or her interest in majoring in that field in college or pursuing a career in that area," said Chris Stephenson, CSTA executive director, in a statement released Monday. "Our innovation economy requires that students take an interest in computing, but a host of factors point in the other direction." 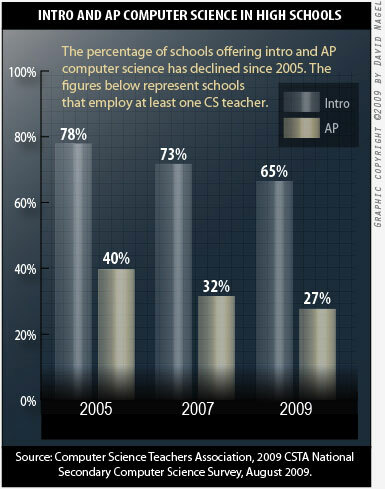 But among schools that offer CS courses, enrollments have not seemed to change much over the last three years. Of those participating in the survey, 23 percent reported that CS enrollments have increased; 22 percent said CS enrollments have decreased; and 55 percent reported no real change in enrollments. But a full 70 percent said there are qualified students who are not taking the CS courses offered by their schools. So what are the challenges that are leading to the decline in computer science? Thirty-one percent reported that NCLB had a negative impact on their CS programs, with the bulk (62 percent) saying it had no impact. Participants also cited lack of teacher subject knowledge, lack of student subject knowledge, difficult subject matter, lack of student interest, and lack of hardware and software resources. But the top 3 reasons cited for the decline were lack of curriculum resources (No. 3), lack of staff support or interest (No. 2), and rapidly changing technology (No. 1). "Computer science teachers are calling out for more effective professional development opportunities, such as workshops, conferences and networking opportunities, to keep up with the state of the field and offer rigorous and challenging courses that engage students," CSTA's Stephenson said. Complete results from the 2009 CSTA National Secondary Computer Science Survey, as well as comparative results from previous surveys, can be found here.